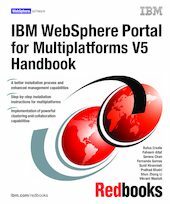 This IBM Redbooks publication positions the IBM WebSphere Portal for Multiplatforms as the solution to best address the process of building scalable and reliable business-to-employee (B2E), business-to-business (B2B) and business-to-consumer (B2C) portals. The IBM WebSphere Portal for Multiplatforms V5 Handbook will help you to understand the WebSphere Portal architecture, how to install, tailor and configure WebSphere Portal, and how to administer and customize portal pages using WebSphere Portal. In this book, we discuss the installation of IBM WebSphere Portal for Multiplatforms within the Microsoft Windows 2000 Server, IBM AIX, SuSE SLE8 Linux, Solaris 8, and zLinux environments using Setup Manager. The ability to set up a clustered environment is covered, as well as a demonstration of migrating from WebSphere Portal V4.2 to V5.0. In this book, we illustrate the implementation and the use of the following directory services: IBM Directory Server, Lotus Domino Enterprise Server, and Sun ONE Directory Server. In the IBM WebSphere Portal for Multiplatforms V5 Handbook, you will find step-by-step examples and scenarios showing ways to rapidly integrate your enterprise applications into an IBM WebSphere Portal environment using state-of-the-art technologies such as portlets. You will be able to implement new and enhanced capabilities incorporated in current releases of IBM WebSphere Portal offerings, which provide powerful collaboration applications such as Lotus QuickPlace, Lotus Sametime, and Lotus Collaborative components.